17 food trucks all in one place! 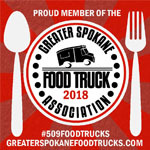 Purchase your ticket to sample food from all trucks. Beer garden provided by Alaskan Brewing Co. Located at Lilac Lanes. Sponsored by Cash & Carry and KXLY. A bouncy castle for kiddos will also be available as well as a photobooth. Get your grub on with over 2lbs of food per person! General admission tickets are $20 in advance, $25 at the door (only 300 door tickets will be sold), VIP tickets are $30 and include early entry to dodge the crowds and a commemorative beer stein. A sample ticket book can be purchased for kids (or extra for yourself) for $10 good for 5 additional samples. Go HERE to get your tickets!